After last week’s jaw-dropper, heart-stopper of an ending to the seventh season premiere of Dexter, “Are You…?,” anxious speculations over the uncertain consequences of Dexter’s critical honesty began to soar. “Sunshine & Frosty Swirl” satiated the need to know what’s next and has—of course—renewed our hunger for more. Check out the mini-synopsis below, and then skip the jump for an in-depth review of our second step into this maddeningly sweet season! CAUTION: SPOILERS AHEAD. 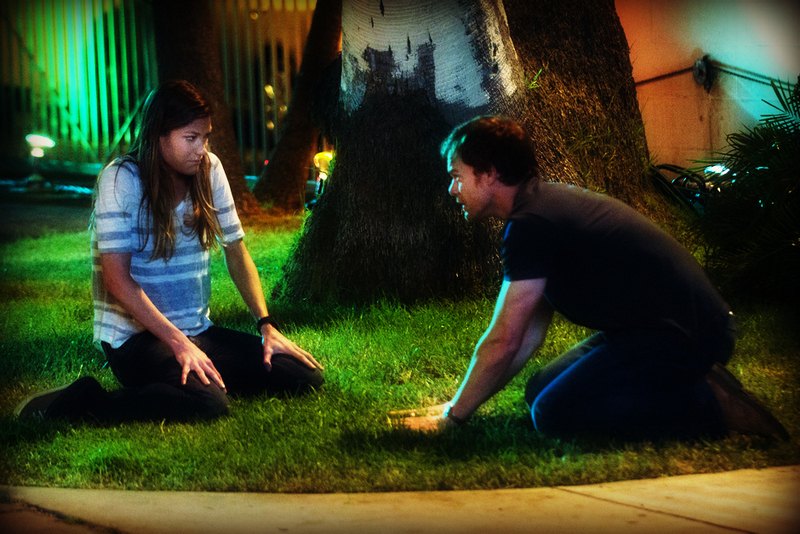 THE BREAKDOWN: Dexter attempts to console the sister whom he has never seen more inconsolable in his entire life, finding himself stripped to the core and forced to become transparent; honest. And such pastimes have never exactly worked out for him before. As Debra begins her passionate campaign to help Dexter and alters his living situation in order to do so, Miami Metro continues to press a local gentleman’s club for information regarding the murder of one of the station’s own. The disappearance of said murderer draws the Ukrainian crime syndicate leader Isaak Sirko on a violent mission to Miami to investigate how this associate of his came to vanish. Miami Metro also takes on the renewed case of Wayne Randall, a sentenced-for-life convict who endeavors to expose the locations of several bodies from a past killing spree. His free acceptance of where his Dark Passenger landed him compels Dexter, who wonders what hope there is for his own—and for his reconciliation with the one person who truly loves him. Skip the jump to read more! 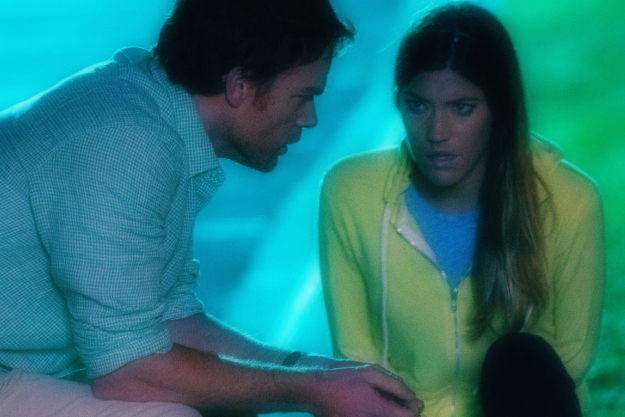 As much as Debra hopes to put Dexter’s Dark Passenger into remission, it isn’t going to be tickled into compliance by a few slumber parties at Deb’s (okay, that sounded wrong—but Dexter’s the one who cracked the joke about them having to shower together under Deb’s strict surveillance plan!). This much we can tell from his keen interest in dealing with Louis Greene, whose sleaziness is being teased out more and more. In full ninja mode, Dexter utilizes an hour of Deb-free time on the job to explore Louis’ apartment, and what he finds is relatively disturbing. He’s got one hell of a geeky, conniving man-whore on his hands. It’s hard to define exactly what kind of a problem Louis is right now, but he is without a doubt dancing with the devil here. 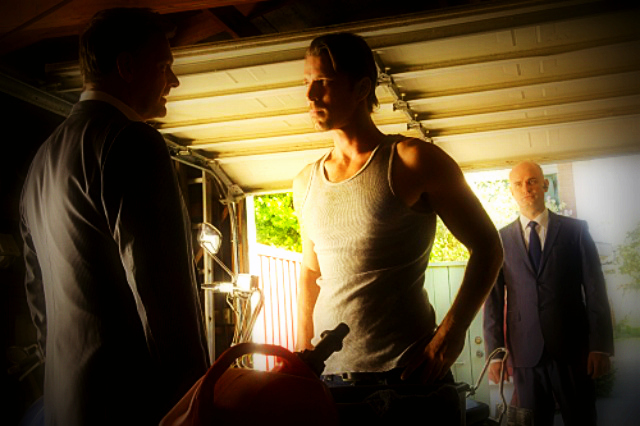 Dexter is ready to unleash the full extent of his need to kill on him, but what stops him—even with Louis’ unconscious body in the back of his car—is surprising. Dexter let Debra take a glimpse into the nature of his need, describing it to her over an overcooked spaghetti dinner as a trickle that surges into a flood—the pressure of which can only be released by opening the “floodgates.” Letting the Need subside and be free. If left unchecked, all he can see is “blood” behind his eyelids that threatens to drown everything, if he doesn’t shed it. Amazingly, he actually allows Debra to intervene before he can off Louis, calling her in the midst of his earnest, unrelenting desire to kill. This, to me, was the most emotional scene in the entire episode. What seemed like another elaborate mask of Dexter’s was actually his effort to be understood and helped by Debra. Debra acts as a sort of anti-Code: Dexter seeks her influence even as his Code calls to him and begs that he push it to its furthest extremes. She really seems to be the Robin to Dexter’s Batman—if we put things in the terms in which Wayne Randall does when remembering his relationship with Hannah McKay. 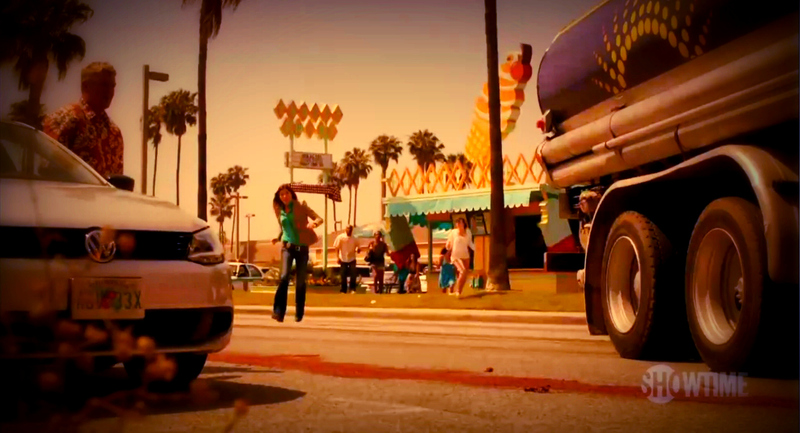 Although Wayne’s existence in the show is dismally short-lived, he serves a very powerful purpose in directing Dexter’s sense of the future, even calling Dexter to focus on the little hopes; hence the episode title, “Sunshine & Frosty Swirl.” Wayne claims that he has come to terms with where his Dark Passenger has taken him to; that all the anger from his addiction fell from him as a scab when he accepted his place. Even though everything around him has changed, he happily clings to the Frosty Swirl ice cream shop, which has survived all the change. When looking at the episode in the context of “Sunshine & Frosty Swirl,” the key theme here is hope. 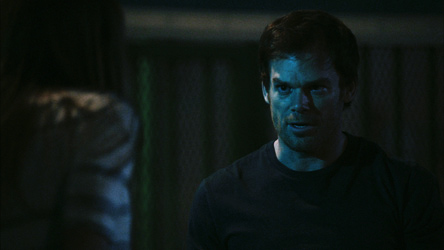 Hope is toyed with throughout the entire episode as Dexter and Debra seem to reach a bit of a reconciliation point, especially after Dexter allows Debra to save him from committing another kill. 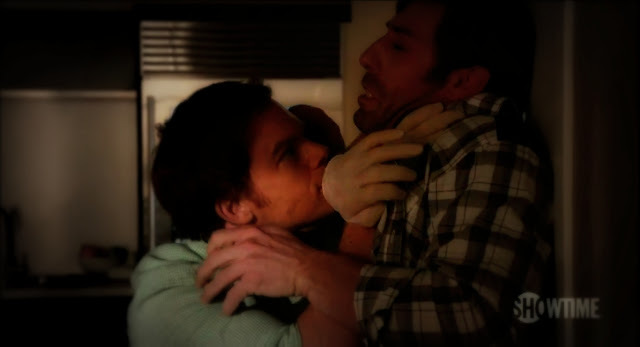 Yet, Wayne’s sudden, brutal suicide in the final seconds of the episode is a wild, wide-eyed game changer that calls into question Dexter’s ability to let his Dark Passenger rest. Beforehand, Dexter tells Debra that he’s “never gonna become normal,” and Debra even quips, “Yeah… none of us really are!” But, is she going to continue to see the progress she yearns for? Will the sun ever set on the Dark Passenger? Who will really have to experience coming to terms… and with what? There are many other intriguing plots that have been edged further into motion now, including those with the revelation of the still-alive Bay Harbor Butcher and the Ukrainian crime activity. Dexter has a very powerful and formidable foe in Ray Stevenson’s Isaak, whose calculating cleverness is not to be trifled with. He’s a man of few words and few reserves when it comes to enacting his own form of justice—and chances are, he’s going to figure out just where Viktor went soon enough. LaGuerta is quietly building her immense case, Quinn is tip-toeing around an interesting and potentially dangerous connection with gentleman club entertainer Nadia, Batista is asserting himself with a vengeance... As a whole, everything is moving, turning, and unfolding. Share your thoughts and reactions about “Sunshine & Frosty Swirl” below! What do you predict is to come in “Buck the System”? Where are we going from here?